Montelukast, or Singulair, is an asthma medication used to ease breathing, chest tightness, wheezing and coughing. It treats breathing difficulties during exercise and allergic rhinitis. Although the pharmaceutical company does not report weight gain as a side effect, anecdotal reports suggest it may be associated with weight gain. Lose weight slowly. Aim for a weight loss of 1 to 2 lbs. per week. If you lose weight too quickly, you're more likely to gain back the weight, according to MayoClinic.com. Reduce calories. Figure out how many calories you're typically consuming in a day using a food journal, then make a goal to reduce that number. Taking 500 calories off that number will result in a 1-lb. weight loss per week, without factoring in exercise. Food journals can also be helpful if you're trying to determine if certain foods cause asthma flare-ups. Consume low calorie, nutrient dense foods such as fruits, vegetables and legumes. Fruits and vegetables are also especially beneficial to asthmatics, because they contain antioxidants like vitamins A and C, according to MayoClinic.com. Antioxidants help reduce lung inflammation caused by free radicals, or chemicals that cause cell damage. Consume leafy greens, which are low in calories and may also help reduce lung inflammation. They're rich in vitamin E, an antioxidant that may help ward off asthma attacks, according to Go Ask Alice, a Columbia University health information service. Eat tomatoes and other red fruits and vegetables. 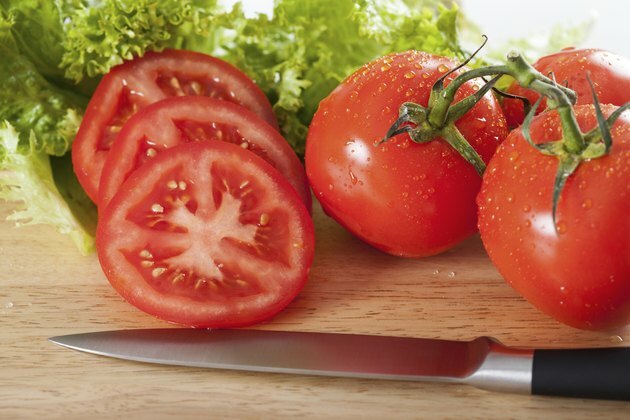 Lycopene, an antioxidant that gives tomatoes their color, may also have a protective effect against asthma attacks. A medium tomato is a low-calorie snack, with about 20 calories. Snack on nuts and seeds, which are full of satiating "good" fats. Selenium, found in Brazil nuts, is another antioxidant. Also try low calorie, nutrient dense snack options like low fat yogurt, smoothies, popcorn, trail mix and dried fruit. Consume foods that have high water content, like soup. If you start a meal with soup, you may be likely to consume less overall calories, according to a 1999 study by Barbara J. Rolls and colleagues published in the "American Journal of Clinical Nutrition." Skip high fat red meat in favor of lean meats like sirloin, fish, turkey and chicken. Lean meats have less calories and less saturated fat. Excess saturated fat is a risk factor for heart disease, and too much fat is a risk factor for obesity. Fish is a good choice for people with asthma because the omega-3 fatty acids found in it may ward against asthma attacks, according to Go Ask Alice of Columbia University. Exercise regularly. Begin gradually if you're not regularly exercising to prevent injury. Increase the intensity of your current routine if you already regularly perform physical activity. Try adding small bouts of physical activity into your day. Take the steps instead of the elevator, or walk to your destination rather than driving. Take precautions since exercise is a common asthma trigger. Keep an inhaler in reach and take your prescribed medications. Your doctor may recommend taking certain quick-acting medications right before exercise. MayoClinic.com recommends keeping symptoms under control by warming up before exercise and avoiding strenuous exercise when you have a cold. Choose humid environments when you exercise. Avoid allergens like pollen. Learn to breathe through your nose to warm air before it hits your lungs. Keep your nose and mouth covered in cold weather. Eat foods that are high in filling fiber. Include a little protein and fat in each meal as well. Protein and fat both increase satiety. Choose healthy fats, like those found in avocados and olive oil, over the unhealthy fats found in fried foods and packaged snacks. Eat breakfast. Eating breakfast reduces hunger later in the day, gives you energy to increase daily physical activity and gets you on track to make healthy choices all day, according to MayoClinic.com. Consume small, frequent meals, which will keep you from getting overly hungry at any one point and keep your blood sugar stable. Overeating is also a trigger for asthma, according to Go Ask Alice of Columbia University. "The American Journal of Clinical Nutrition": Water Incorporated into a Food but Not Served with a Food Decreases Energy Intake in Lean Women; Barbara J. Rolls, et al. ; October 1999. MayoClinic.com: Breakfast: Why Is It So Important to Weight Control? MayoClinic.com: Asthma Diet: Doe What You Eat Make a Difference?